St. Louis is breaking out the 1999 throwback uniforms for Monday Night Football tonight, and goddamn, it brings back some fond memories. I genuinely wonder how much of that is the actual uniform and how much is the fact that it was last worn by one of the most exciting teams of football's modern era. 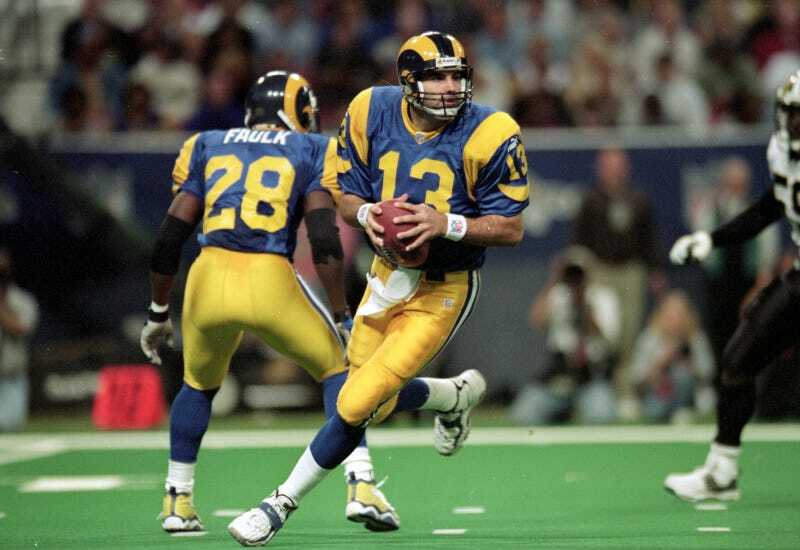 The Rams abandoned royal blue and yellow after the 1999 season, the first and most successful of the "Greatest Show on Turf" years. Instead they opted for a duller combination of "Millennium Blue" and "New Century Yellow," names that date it more than those eye-popping, comic-book colors ever did. In a vacuum, I don't know if I'd so warmly remember the almost-cartoonish colors if I didn't picture them on the likes of Kurt Warner, Marshall Faulk, Isaac Bruce, Torry Holt, and Az-Zahir Hakim, who got out in front of one of those periodic NFL pendulum swings from defense to offense and put up numbers that wouldn't be out of place today. The Rams haven't been particularly watchable since the Mike Martz days, either. Rams executive Kevin Demoff has been making noise since last year about overhauling the team's look, and in the spring he hinted that permanently returning to the '90s scheme is definitely on the table.